While Mississippi’s primary industry is agriculture, employing approximately 17 percent of the workforce, the state’s economy also relies on the manufacturing, fishing, gambling and hospitality industries. Nearly 17,000 associate degrees and certificates were awarded in Mississippi in 2010 with programs training students for the fastest growing career sectors in the state, including information technology, hospitality and tourism. This page outlines vocational and trade school options in Mississippi, as well as career opportunities and resources for students and graduates. An analysis of Mississippi's trade and vocational offerings can be found in the following rankings. Students attending any number of Mississippi's community college and vocational school programs will be interested in studying in a field that will prepare them for work in agriculture or manufacturing, two of the state's booming industries. Potential students should check out our rankings of Mississippi schools; our list is based on various factors, including financial aid, tuition, student-teacher ratio and other points that matter most. Hinds Community College's two year vocational programs are offered in specialties like business and office technology, electronics, construction, mechanics and landscape architecture. Hands on and classroom training are offered. The school has agreements with four-year schools like Delta State University, Mississippi State University and Mississippi University for Women. Depending on the agreement, Hinds Community College graduates could go on to earn a Bachelor's degree from one of the regional schools while taking classes at a Hinds Community College campus. They could also earn a Bachelor's degree on an accelerated track. The ACT, CLEP (College Level Examination Program) and DANTES Subject Standardized Testing are types of accepted placement or admissions tests. Three major hubs where on campus classes are taught Scooba, Golden Triangle and Columbus Air Force Base. Associate of Applied Science degree options cover career fields like nursing, forestry, hotel and restaurant management and welding and fabrication. Dual enrollment and dual credit programs are for secondary students who want to start taking college courses while they are still in high school. East Mississippi Community College operates on an open admissions policy. Courses are taught by experienced faculty in their respective fields which may ensure a comprehensive learning environment. Vocational programs are taught in more than a dozen specialties. Among these degree programs are graphic design, office systems technology, funeral service, paralegal and aviation. Depending on the program, up to 70 credits may be required to graduate. Programs like funeral services technology require students to pass national board exams to graduate. Credits are transferable to accredited four-year universities and colleges in Mississippi. Vocational classes are taught at the Senatobia, DeSoto Center-Southaven, DeSoto Center-Olive Branch, Lafayette-Yalobusha Technical Center-Oxford and Benton County Career Technical Center-Ashland campuses. Formerly called Itawamba Junior College, Itawamba Community College confers certificates and associates degrees in about 30 majors, including commercial automotive technology, law enforcement, truck driving, practical nursing and welding and cutting technology. Goal of these programs is to prepare adults for entry-level roles in their chosen career field. ACT scores are required for students younger than 24 years of age. Older students must submit ACT scores if applying for admission into a program that requires an assessment. The community college has articulation agreements with Mississippi's public universities, allowing students to transfer all of their credits into the public universities' four year degree programs. Occupational programs at Mississippi Gulf Coast Community College are designed to prepare adults to embark on careers in fields such as electrical technology, marine pipefitting, banquet and catering service and commercial/residential maintenance. It takes about 60 credits to graduate with a two-year degree from the programs. Articulated credits are accepted. Through articulation, students could receive up to 38 semester hours if they score an 85 or higher in a relevant secondary program. Aptitude tests may be required to get accepted into certain programs. The school follows an open admissions policy. The Mississippi College Board oversees 15 community and junior colleges around the state in addition to the Mississippi Virtual Community College, offering individual vocational programs in hundreds of areas of study. Mississippi is home to several technical schools, specialized training centers and universities that have patterned with community colleges, which makes the transition to a four-year college easier and more cost effective for students. 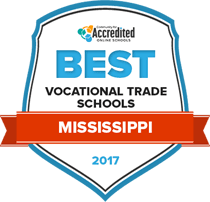 Use the search tool below to find the right vocational and trade school in Mississippi for your career goals. 4,748 high school students enrolled in a vocational and trade program enrolled in a Mississippi community college or public university within 16 months of high school graduation in 2014. 131,461 students were enrolled in a vocational and trade program at a public high school in 2013 and more than 56 percent of graduates went to a community college in 2014. More than 61 percent of trade school graduates went to college for a STEM program in 2014. 1,145 vocational and trade participators graduated from a community college within three years of enrollment. Many technical colleges and community colleges in Mississippi offer certificate and diploma programs that can be completed in one to two years. The United Way Common Good Forecaster projects that if the number of Mississippi residents with an associate degree increased by 10 percent, the state would increase their median per capita income by $859 and there would be 9,600 fewer unemployed individuals. Vocational school graduates in Mississippi can explore healthy career opportunities in manufacturing, fishing, hospitality and oil industries. Data from CareerTech.org shows that by 2018, the hospitality and tourism industry in Mississippi is expected to grow to 177,000 jobs. Many trade programs offer hospitality management and marketing certificates to fill this employment demand. The Career Tech report indicated that the information technology sector is expected to be the fastest growing industry through 2025, opening carriers in design, development and systems integration services. The table below reveals in-demand occupations, projected job growth and wage information for Mississippi workers. Jackson is home to several technical and community colleges offering programs in skilled trades, business and information technology. Hinds Community College Jackson - Academic/Technical Center is one of the larger colleges in the area and boasts a state-of-the-art campus. HCC has a Two Plus Two agreement with Delta State University and the University of Southern Mississippi so students can work towards a bachelor’s degree after completing an Associate of Art degree program. Students who intend to stay in the Jackson area after graduation can find jobs in public education, manufacturing, healthcare services or state government. The State of Mississippi is the largest employer in Jackson with more than 31,500 employees, spelling out job prospects for graduates for government administration, human resources and education programs. Vocational school graduates may be able to find work at other major employers in the area, including University of Mississippi Medical Center, Jackson Public School, Nissan, Mississippi State Hospital or AT&T. Comprehensive report on Mississippi’s academic and CTE integration, career cluster program areas and participation rates. Includes information about upcoming ACTE conferences and events. Provides membership opportunities for CTE educators. The site includes updates about upcoming events, national awards and conferences. Oversees programs for the 15 community and junior colleges around the state. The site includes annual reports and information about vocational and trade programs. Provides information about vocational and trade programs and the school-to-careers transition program. Provides resources to connect employees with employers and provides details about state universities and community colleges. The Mississippi Works section is dedicated to workforce and training programs and information about key industries in the state. Comprehensive list of resources for industrial workers with information about workforce training programs specifically for area businesses. Includes a list of sites and buildings around the region and key industries in north Mississippi.